Maiden Castle is just outside the City of Durham. It is the site of an ancient fort, probably of iron age origin. It was named maiden because it was a virgin fort, not penetrated by invading forces. The wooden scar is an interesting geological of the area. 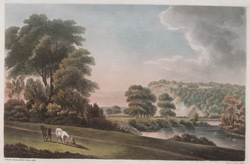 This is one of four views of Durham by William Brown.